The fact that Sarasota is an attractive destination for people 50+ is not an accident. The county’s median age increased from 50.7 in 2009 to 54 in 2015. The good news is that people moving to this locale are living longer and enjoy a lower crime rate than metro areas of similar size, making Sarasota a very desirable destination. 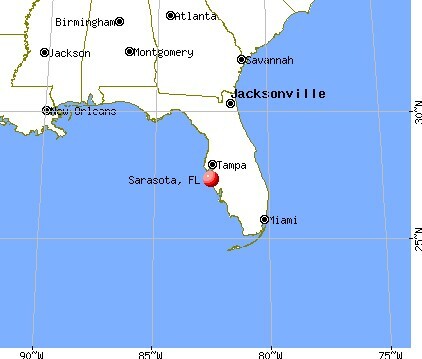 The city of Sarasota is south of Tampa on Florida’s Gulf Coast. Its claim to fame? It was once the winter home of the Ringling Brothers Circus. Today it is an art and cultural center (10 theaters, a professional symphony, the ballet, and 30+ art galleries), the home to the Ringling Museum of Art and, when there is no Red Tide, it offers access to miles of beaches complete with fine white sand and shallow waters (i.e., Lido Beach and Siesta Key Beach). It is a terrific destination for walking and biking with open spaces at the Myakka River State Park and the Oscar Scherer State Park plus the Marie Selby Botanical Gardens (for horticulturalists). There are film festivals, performing arts theaters (especially the Van Wezel). It is also noted for its mild weather (although hot and muggy in the summer), and nearby golf courses, kayaking, sailing, swimming and jogging. The healthcare system is considered among the best in the state of Florida with the Sarasota Memorial Hospital and Doctors Hospital of Sarasota within easy driving distances. The People’s National Movement won Trinidad and Tobago’s election. The current opposition won this Caribbean island country's general elections late on September 7.